Caisleán Bhun Raithe is Irish for Castle at the Mouth of the Ratty; at this location in County Clare, Ireland you will find Bunratty Castle. The idyllic Irish castle is set in the center of Bunratty Village, adjacent to the Bunratty Folk Part. The castle is a five floor tall tower house; the large building is constructed from locally source grey stone. Bunratty Castle is the most authentically restored and complete medieval fortification in Ireland and it is complete with a collection of over 450 genuine artifacts that include medieval furniture and tapestries along with works of art. This popular tourist attraction is operated by Shannon Heritage and boasts over 350,000 visitors per year. Several years ago, I, along with my group, was one of those visitors. We really enjoyed the unforgettable medieval banquet eaten without utensils except for the ‘dagger’ to spear the delicious potatoes and vegetables along with delectable ribs and chicken. Customary of the period, you may also use your fingers to eat. The delightful soup was pureed and served in a wooden bowl that was consumed by drinking directly from the bowl. For libation we enjoyed limitless pitchers of red and white wine, along with honey mead. I asked our server, "Where in Ireland is the wine produced?" She smiled as she replied, "California. Ireland is the land of Jameson and Guinness, not wine." The food was served by a cast dressed in the period costume of the 15th century with the servers providing entertainment as you partake of the authentic and enjoyable Irish feast. It was a truly enchanting evening from the moment we arrived. These enjoyable medieval banquets have been an almost nightly event since 1963, but they do not represent Bunratty Castle's turbulent past which included civil war, occupation and bloodshed along with the building's destruction, three times over. The present structure was vacated when the roof of the great hall collapsed in the latter part of the 19th century. The castle fell into great despair until it was purchased in 1954 by Viscount Lord Gort, who, with the help of the Irish Tourist Board and Government, restored the stone stronghold. 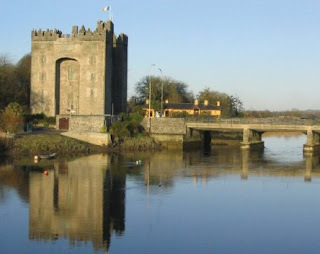 In 1960 Bunratty Castle was opened to the public as a national monument. It was a special treat for this writer to be in County Clare where my grandmother, Mary Hocking, was born and who, at the tender age of 17, departed for America.